The Warehouse Ensemble is currently New Haven Connecticut’s only running teen theater program. It consists of 15-20 talented teens from around New Haven who have discovered and developed their performance skills while in the program. 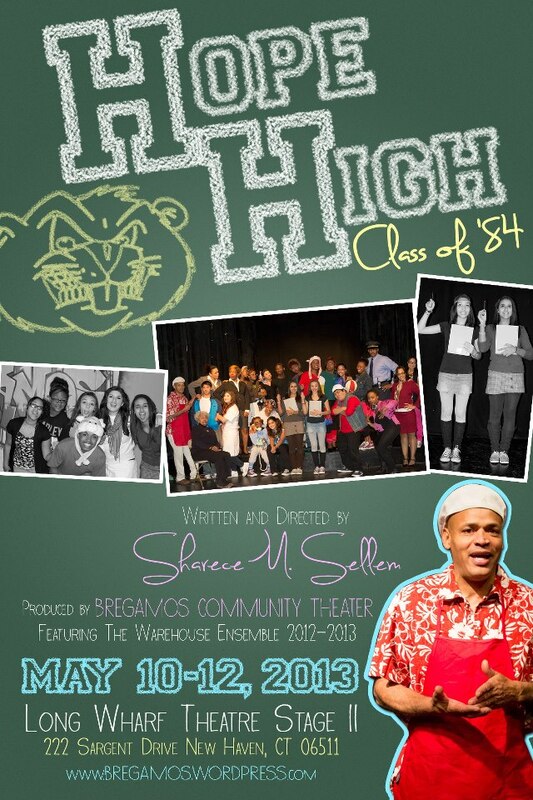 This year, the group launches their first play production, HOPE HIGH Class of 84,’ at the prestigious Long Wharf Theater. This production is an original, written and directed by dramatic arts instructor and Bregamos Artistic Director, Sharece M. Sellem along with Tianna Glass as the Assistant Director. This program has been made possible by it’s Producer, Rafael Ramos, Founder and Owner of Bregamos Community Theater (BCT). INTERESTED IN THE PROGRAM? The next enrollment will be announced Fall of 2013! 2012/2013 Bregamos First Youth Program & Ensemble! introducing its first teen program and ensemble named, “THE WAREHOUSE ENSEMBLE.” Fifteen talented and committed teens will be selected by the end of the following week to be a part of the theater ensemble. This theater intensive program includes training, workshops and field trips and will begin in November and end in June 2012. THE WAREHOUSE ENSEMBLE and members of the community ages 12-adult will also be selected to participate in the production, HOPE HIGH Class of 84’ scheduled for May 2013. Interested visitors of the open house event will have the opportunity to sign up for the audition dates and times for a role in this upcoming production. An open mic jam session will follow after. Refreshments will be served. This event is FREE and open to the public. Poets, singers, dancers, actors, and musicians of all ages are highly encouraged to attend.